After an accident at a nearby oil-drilling site displaces a strange and subterranean creature with a taste and a talent for speed, high school senior Tripp may have just found the key to getting out of town and a most unlikely friend. Folks who follow box office receipts didn’t need to wait long to find 2017’s first massive bomb. With a budget of $125 million, January’s Monster Trucks mustered a poor $33 million in the US and a worldwide total of barely $64 million. Add to that poor reviews and Trucks became a costly flop. Did it deserve its fate? Probably, as the movie fails to create a memorable adventure. High school senior Tripp Coley (Lucas Till) hopes to escape from his small town existence. To facilitate his departure, Tripp builds his own “monster truck” out of various parts he scrounged. Tripp’s life takes an unusual turn after a mishap at a nearby drilling site unearths a weird tentacled creature. Tripp and the critter he names “Creech” go on adventures and come up with one overriding goal: to reunite Creech with his family. Hmm… unhappy young person bonds with a strange non-human being and then tries to get this creature back to his people – where have I heard that story? A lot of places, though obviously Trucks comes with a serious ET vibe. The presence of a derivative plot shouldn’t doom Trucks, and the movie comes with some potential for success. At the very least, it involves talented, successful filmmakers – director Chris Wedge launched the Ice Age franchise, and screenwriter Derek Connolly penned hits like Jurassic World and Kong: Skull Island. Connolly also got the gig to write Star Wars: Episode IX. I hope he finds more inspiration with that film than with Trucks, a sluggish and silly tale. At all times, Trucks wears its influences on its sleeve. In addition to ET, we get signs that point toward Cars, the Transformers series and plenty of others. Trucks barely bothers any attempts at creativity. Even if we ignore the movie’s many obvious lifts from prior efforts, Trucks simply lacks any sense of excitement or fun. The entire project feels like a committee cobbled it together, with scenes so gratuitous and perfunctory that it can’t manage any form of momentum. Till seems woefully miscast as Tripp, partly due to his age. The 26-year-old Till might pass for a teen at Rydell High, but in the real world, he seems far too old for the part. This becomes especially true when Tripp needs to show boyish exuberance. For instance, in one scene, Tripp “play drives” his truck, and his antics come across like those we’d get from a 10-year-old, not a guy who looks like he finished grad school a couple of years ago. Trucks saddles its story with a lot of uncreative elements, with the forced relationship between Tripp and classmate Meredith (Jane Levy) at the fore of these. Does Tripp really not notice how hot Meredith is? Are we supposed to view her an unappealing because she likes books and science? Does anyone over the age of seven feel surprise when their situation turns romantic? Nope to all those, and nope to any other hopes of inspiration or excitement. Even when Trucks goes for thrills and fun, it sputters, as it fails to develop in a manner that opens it up to these elements. 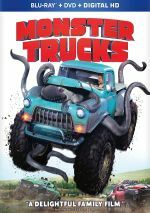 Of course, Monster Trucks shoots for a young audience, and I suspect they won’t mind its many flaws too much. For anyone over the age of 10, though, this becomes a flat, bland attempt at adventure. Monster Trucks appears in an aspect ratio of approximately 2.35:1 on this Blu-ray Disc. The movie offered a fine visual presentation. Sharpness worked very well. Any instances of softness remained confined to a handful of interiors and seemed negligible, as overall definition appeared excellent. No signs of jaggies or moiré effects occurred, and I witnessed no edge haloes or print flaws. In terms of palette, the movie often went with Hollywood Standard Teal and Orange. Within those constraints, the tones appeared well-reproduced. Blacks were dark and deep, while shadows looked smooth and clear. The image satisfied. I also liked the excellent Dolby Atmos soundtrack of Trucks. Because I don’t have an Atmos-equipped system, this played back as a Dolby TrueHD 7.1 mix, and it gave us an exciting presentation. With a lot of action on display, the soundscape boasted many opportunities to shine, and it took advantage of them. The titular “monster” contributed to most of these, but other sequences bolstered the involvement factor as well. Add to that nice stereo music and some directional dialogue to end up with an engrossing soundfield. Audio quality also pleased. Music was peppy and full, while speech seemed natural and concise. Effects appeared dynamic and accurate, with solid low-end response. The soundtrack kicked into high gear often enough to earn an “A-“. 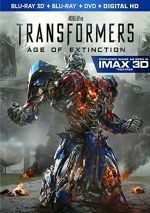 The Blu-ray comes with a smattering of extras, and Who’s Driving the Monster Trucks? launches these. It goes for seven minutes, six seconds and includes comments from director Chris Wedge, screenwriter Derek Connolly, CG supervisor Chris Downs, animation superviisor Daryl Sawchuk, and actors Lucas Till, Jane Levy, Danny Glover, Barry Pepper, Thomas Lennon, Rob Lowe, and Amy Ryan. “Driving” looks at story/characters, cast and performances, visual effects and Wedge’s move from animation to live-action. A handful of decent details emerge but much of “Driving” feels puffy and insubstantial. With The Monster In the Truck, we get a four-minute, 57-second piece with Wedge, Sawchuk, Downs, co-producer Kurt Williams, head of technical animation Angela MacGrath, VFX supervisor Nicolas Aithadi, lead digital artist Andrew Doucette, DFX supervisor Axel Bonami, digital artist Chris Sokalofsky, and 2D supervisor John Paszkiewicz. The program discusses design and execution issues related to the vehicles and creatures. It delivers a passable overview. Next comes Creating the Monster in the Truck. It lasts six minutes, 29 seconds and features Wedge, Williams, Levy, Till, Lennon, Lowe, Glover, Pepper, Connolly, stuntman Anthony Moyer, special effects supervisor JD Schwalm, production designer Anthony Menzies, stunt coordinator Andy Gill and picture car coordinator Tyler W. Gaisford. “Monster” examines aspects of the movie’s practical vehicles, and it becomes another moderately informative reel. A Gag Reel runs four minutes, 35 seconds. It shows the usual goofs and silliness. A few improv lines from Tom Lennon amuse, but don’t expect much. Six Deleted Scenes take up a total of eight minutes, 36 seconds. Some of these expand the Tripp/Meredith relationship, while others add a little more action to the tale. The character sequences seem unnecessary and tedious, but the driving shots contribute a little pizzazz. Finally, we find 10 Production Diaries. All together, these fill 10 minutes, 13 seconds and give us info from Gill, Schwalm, Levy, Till, Lowe, Lennon, Moyer, and Gaisford. The “Diaries” offer snapshots of various aspects of the shoot. They vary in terms of quality but they offer some fun moemnts. A second disc presents a DVD copy of Trucks. It lacks any of the Blu-ray’s extras. Derivative and uncreative, Monster Trucks feels like a conglomeration of elements borrowed from other films. It fails to convey any real thrills or fun as it explores its well-trodden territory. The Blu-ray offers excellent picture and audio as well as a handful of supplements. The film may entertain younger kids but that becomes the extent of its appeal.